COMMUNITY organisations whose work has supported and developed young people in Cambridgeshire were showcased last night (Wednesday, 1 July) at an event organised by Police and Crime Commissioner Sir Graham Bright. All the organisations present at the ‘Celebrating Young People’ evening had received money from Sir Graham’s Youth Fund. This fund was set up in April 2014 with Cambridgeshire Community Foundation to support grass roots initiatives which divert young people away from risk taking behaviour. Grants totalling £36,460 were awarded to 25 different projects in 2014/5 benefiting more than 1,000 young people. Over the past year Sir Graham has visited many of the award recipients and seen first-hand how their work has supported and encouraged young people to become valuable members of their communities. Three of the organisations he visited received special surprise Youth Fund awards at last night’s event to enable them to continue their work with young people. 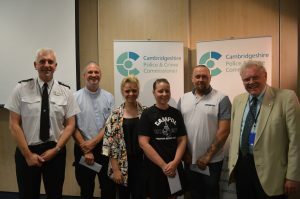 The representatives from Churches Together in Central Peterborough, the Garage Community Trust and the Peterborough Police Amateur Boxing Club were presented with the extra funds by Sir Graham and Deputy Chief Constable Alec Wood. The event, which was attended by a prestigious audience that included several Mayors, was hosted by Volunteer Police Cadets from the Peterborough Unit. The Head Cadet Sanna Aftab opened the event and shared her experience of becoming a police cadet. Afterwards Sir Graham said: “It really was an evening to be proud of. To see both Volunteer Police Cadets alongside young people who have benefited from the Youth Fund showed me that a small amount of money can make a significant difference. The Youth Fund makes good use of the Police Property Act which allows the Force to use monies received from the sale of found property and from property confiscated by order of court and then sold. Community groups and charities have been able to apply for grants up to £2,000 for projects related to activities that have the potential to divert young people from risk taking and potentially criminal behaviour. Sir Graham has committed a further £40,000 to be allocated in 2015/16.